i was never a fan of mrs. fields; they always seemed so undercooked/raw. i love these though. oats in a cookie with choco always taste so good. I love the way you write about food. I’m one of those people who is known to read cookbooks as bedtime stories. This story would give me very pleasant dreams. I will try these sometime soon (and I know I won’t shake off the salted macadamia nuts). I am of the opinion that nuts in cookies are gratuitous as well. Except for white chocolate macadamia nut cookies. Those I could ingest at lightning speed and not thing twice. From what I can see, Mrs. Fields has nothing on you! Mrs Field’s cookies were a huge thing when I was growing up in Illinois. I even have her cookie cookbook, and the cookies do have a lot of sugar in them. 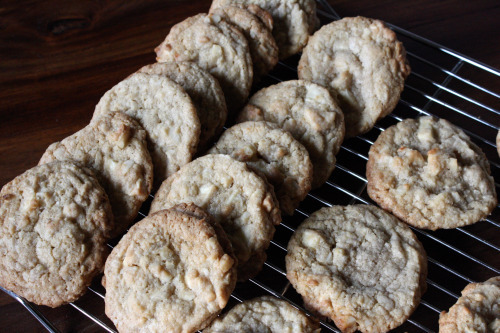 Your cookies look delicious, and white chocolate with macadamias is just the best. I remember when Mrs Fields’cookies started popping up in malls and my friend Lise was raving about them and eating one every day for breakfast! I always thought they were way too sweet but then I was not brought up in America! I heard even Godiva makes their chocolate sweeter for the American market! This above recipe is great and definitely pleasing to husbands and kids! I remember when some cookies tasted better before. But now that I bake them, homemade is infinitely better. These cookies look awesome. Thanks for the cookbook recommendation! I’ll add it to my ever growing list. ;) I love white chocolate in cookies but don’t often use it. 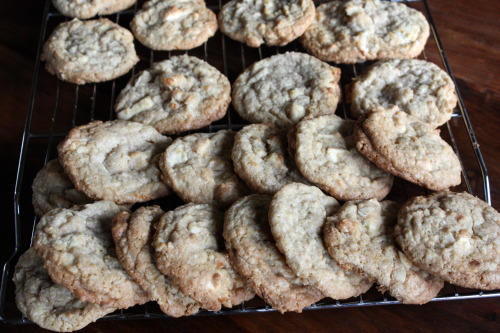 My hubby is heading up to Whidbey Island this weekend for a boys weekend and requested I make white chocolate mac nut cookies, so I’m trying this recipe today! And while he’s gone, I’m having a girlfriend over to cook and we’re going to try your Macadamia Shortbread Brownies tomorrow!